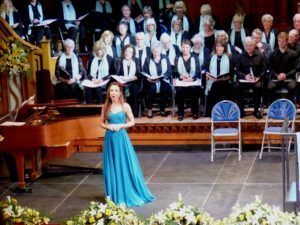 Ayr Choral’s Spring Concert features choral music on a grand scale, with a performance featuring two familiar and much loved compositions for choir and orchestra – Mozart’s Requiem and Bach’s Magnificat in D. The Choir will be joined by a professional orchestra, and five soloists – Ellen Mawhinney and Jessica Leary (Sopranos), Sioned Gwen Davies (Mezzo Soprano), Ted Black (Tenor) and Orlando Mason (Bass). This spectacular programme, with the celebratory Magnificat and the dramatic and emotional whirlwind of the Mozart, will be conducted by our eminent Musical Director, Andrew McTaggart. Christmas with Ayr Choral used a selection of music from Bach’s Christmas Oratorio and Vaughan William’ Fantasia on Christmas Carols to link with both our October concert (Dona Nobis Pacem) and our Spring concert 2019 when we will perform the Bach Magnificat. Other music included the beautiful Allan Bullard Scots Nativity, Rutter’s Christmas Lullaby, Whitacre’s Glow, and a splendid Christmas Medley, arranged by Gordon Cree and sung with our special guests the Newmilns and Galston Brass Band. The Band also had their own contributions to a very eclectic programme! Our Baritone soloist was Colin Murray , and the concert was conducted by our Musical Director, Andrew McTaggart. Marking the centenary of the end of World War 1, the concert will be a mix of both dramatic and beautiful music with a direct link to wartime in Britain. Soloists will be Catriona Hewitson and Graham McCusker, and accompanists will be Andrew Forbes on piano and Andrew Huggan, cellist. Ayr Choral members conducted by Gerry Doherty sang a varied programme to a select but enthusiastic audience in Paisley Abbey for their Saturday lunchtime concert. It was thrilling to sing in this ancient and beautiful building and we were invited to return at any time! There was a coffee morning with home baking in Place of Paisley, adjoining the Abbey, which many of the singers enjoyed and appreciated. As part of a worldwide celebration of the 100th anniversary of Leonard Bernstein’s birth, we sang the Chichester Psalms – an exhilarating work, accompanied by the City of Glasgow Symphony Orchestra, including brilliant percussion and wonderful wind playing. At his last major concert as conductor, Gerry Doherty led us in an exciting and spirited rendering of several psalms in Hebrew, commissioned by Chichester Cathedral in the 1960’s. Daniel Cook, a boy soprano with the RSNO children’s chorus sang beautifully and our quartet of soloists included Charlie Drummond, soprano, Rosamund MacDonald, mezzo, Ted Black, tenor, and Connor Smith, baritone. We ended the first half with two versions of the 23rd Psalm by John Rutter and the familiar theme to the Vicar of Dibley by Howard Goodall. In the second half we presented John Rutter’s Magnificat, a joyful work enjoyed by choir and audience, who received the whole programme enthusiastically. Our soloist Charlie Drummond created a wonderful atmosphere in the two quieter movements. In a presentation Gerry was thanked for his fantastic contribution to the choir over the past 17 years. 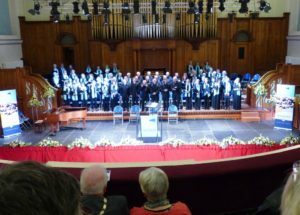 He reminisced about works we had sung, people he had worked with, and the sense of satisfaction and pleasure he had had working with the choir. A great evening of celebration for everyone. Sunday 17th December 2017 in Ayr Town Hall at 7.30 pm. An almost full house enjoyed our presentation of familiar and new Christmas songs and carols, accompanied by well known local pianist and organist Gordon Cree. Particular hits were Tchaikovsky’s poignant Crown of Roses, In Winter by Texan composer, Victor C Johnson and Scots Nativity by Alan Bullard. The audience made the most of their opportunity to join in the four traditional carols. Newmilns and Galston Brass Band played two sets which were enthusiastically applauded, and joined the choir for the finale of Have yourself a merry little Christmas and John Rutter’s The very best time of year – Santa hats and tinsel provided the final festive touch. Andy McTaggart, our associate conductor, conducted his first concert with us and Connor Smith led us in two carols, Sleep little baby sleep and Lullaby my Jesus. Sunday 29th October 2017 in Ayr Town Hall at 7.30 pm. An exciting and melodic evening of music from the early 17th century by De Padilla (Mexico), to music from the past 100 years by Aaron Copland, Randall Thompson, Eric Whitacre, Morten Lauridsen and George Gershwin (all USA) and Michael Tippett’s Spirituals from A Child of our Time (UK – 1939-41). Soloists were Hazel McBain – Mezzo Soprano and Whitaker Mills – Baritone; accompanist – Ed Cohen. We were led by our conductor, Gerard Doherty. A large and enthusiastic audience heard A Choral Tapestry with works from Mozart to MacMillan, performed by around 40 members of the choir in St Giles Cathedral, Edinburgh. The beautiful sanctuary echoed with excerpts from Vivaldi’s Gloria and Brahms’ German Requiem, followed by O Radiant Dawn and Quas ego by MacMillan; three pieces on the Virgin included works by Mozart, Bardos and Dubra, and the concert concluded with Rachmaninov’s Bogoroditse, Roberton’s Iona Boat Song, and Rutter’s Gaelic Blessing. As an encore, the choir sang Ye Banks and Braes o Bonnie Doon, by Burns. Audience members were generous in their praise of the choice of programme and performance. Two choral members were stopped by a couple from South Carolina, USA who had really enjoyed the concert, and hoped to hear us sing again!